When you write about the markets with regularity, you sometimes struggle to come up with a unique angle or the perfect headline. Sometimes you start with a headline and write to it accordingly. Other times you start with a general point or theme and go from there. Depending on the venue and other-assorted variables, I routinely utilize both approaches, skewing more toward the latter method. One additional approach I often use is to step back and allow myself to be led by the tea leaves, as it were…very much like my trading. More often than not, the best trading opportunities and/or stories/issues most deserving of coverage become easily apparent in such manner. Fair to say such was my approach today. One look at the charts and headlines out there and it’s apparent that, just as a week ago, Gold is the story of utmost import. Even the headline I selected was easy. Looking at both a long and short-term chart leaves you with the same impression – namely, the metal is looking fatigued and the long-standing bull trend in Gold is arguably in some serious peril. If you read last week’s posting, you know I’m not overly surprised with the selloff that ensued this week, given the macroeconomic backdrop, and more so the way Gold was presenting on the map. Back stepping a week, I talked about the primary trend break and the fact the metal had just broken its secondary trendline support. 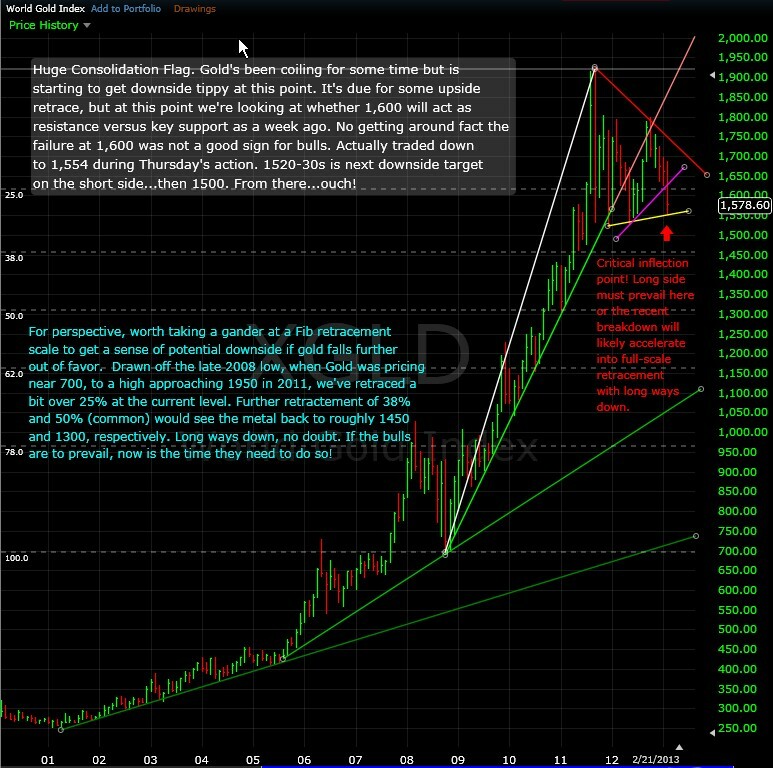 More to the point, I suggested that Gold was probably ripe for a trade entry, as it had been tightly coiling and seemed ready for a breakout to the downside (the more favorable scenario) or a quick reversal, in which case 1600 would have to be retaken and tested…which would offer a good base to enter on the long end. Obviously the short-side trade did work and sentiment is decidedly more in favor of the bear camp as we close this week. So now we find ourselves just above the REAL TEST – 1520ish, representing the lower-end of a consolidation zone that’s existed the past 16-plus months. That zone, ranging from 1520s to 1800, was created in the wake of the parabolic run that culminated with Gold topping the 1920 mark in early September 2011, before quickly correcting nearly 400 points just 20 days thereafter. The precious metal has tested the upper end of the consolidation zone on three occasions and now finds itself at the bottom of the consolidation zone for the fourth time. Surely a fair number of gold bugs out there experiencing the pucker factor right about now, feeling they’re against the ropes. Those shorting the metal gotta feel they are nearing a tipping point that will see even the most ardent supporters bug out…in which case Gold is gonna head a lot further south…perhaps very quickly. Yes indeed, the bull-market trend in Gold that dates more than a decade (near parabolic since ’08) would seem in serious peril. 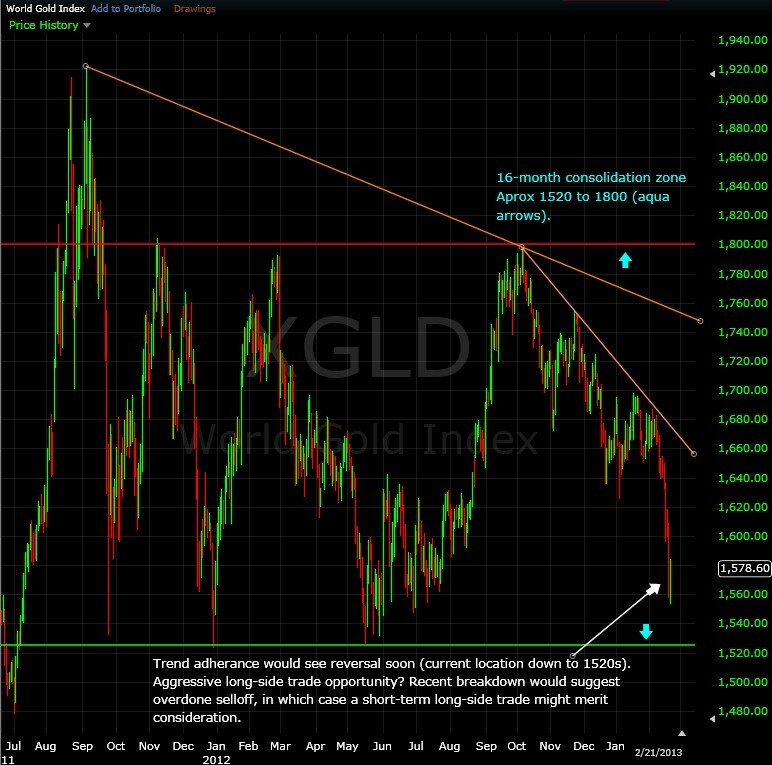 If Gold breaks through 1520s (let’s call it 1500), then yet another significant trend support area would have given way and the floodgates might well open. Not sooooooo much….at least, not yet……………………. While it seems unlikely this day, truth is that if bulls get serious and buy this back up over 1600 (which can be easily accomplished – if seriously attempted), and manage a hold of that level on a test, a whole lotta sideline money is gonna get scared in and you can bet shorts are gonna get sweated…probably even squeezed. Yes, emboldened bears need pay heed to the fact that trend adherence is a norm in the market… If that tenet holds true yet again, then this baby is about to reverse…at least short term…perhaps for yet another trip up to the top end of the aforementioned consolidation zone. 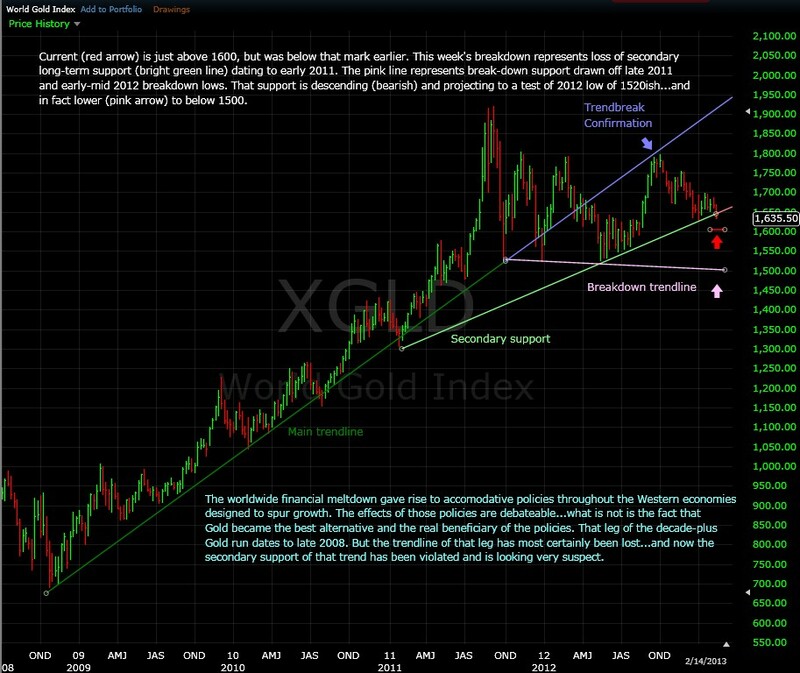 One last point both sides should consider if Gold does crater from this area on the map – a trip down to the 1450 level and perhaps even 1300 might not spell doom for the longstanding bull-run. 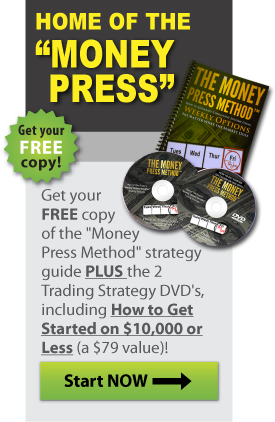 Such activity might just represent healthy retracement supporting the next upside move that could see the metal trade through 2K and well beyond – just as many gold bugs have been contending all along.